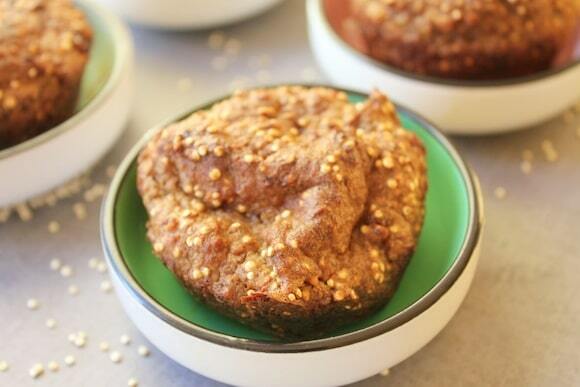 These High-Fiber Seed & Quinoa Muffins are healthy and full of all the good things. Serve them for breakfast or a delicious treat. They’re amazing for digestion! 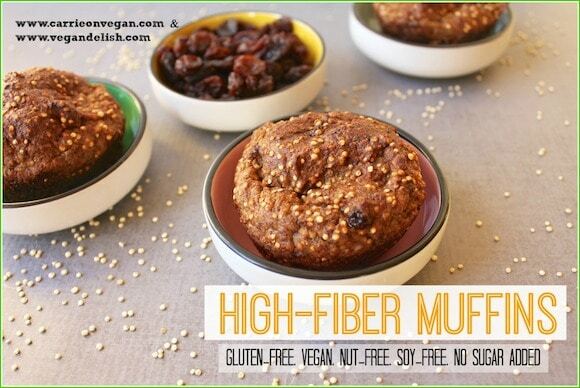 Well, it doesn’t get much sexier than a High-Fiber Muffin, eh? I ran into one of my senior-ish neighbors recently and she started talking my ear off about how good digestion is so important when one gets older. Um, hello, digestion is my middle name! So, of course, I agreed with her, but I would argue that good digestion is important at any age. One ingredient that is new to me that I found in the bulk section at the health food store is ground psyllium husk, otherwise known as a key ingredient of <ehem> Meta-mucil, which I only found out because I was doing research on it. A great breakfast or treat. Preheat your oven to 350°F. Spray a muffin tin lightly with non-stick cooking spray and set aside. 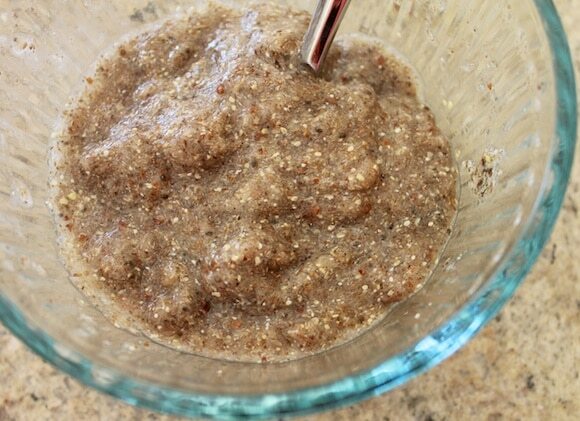 Combine the ground psyllium, ground chia seeds, and flax meal in a small bowl. Add water and use a spoon to stir together. Set aside for at least 5 minutes to thicken. 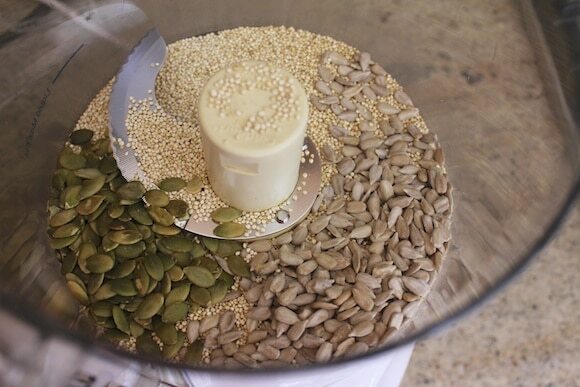 Place the pumpkin seeds, sunflower seeds, and uncooked quinoa in a food processor. Pulse for several times until the seeds are broken up, but not pulverized. 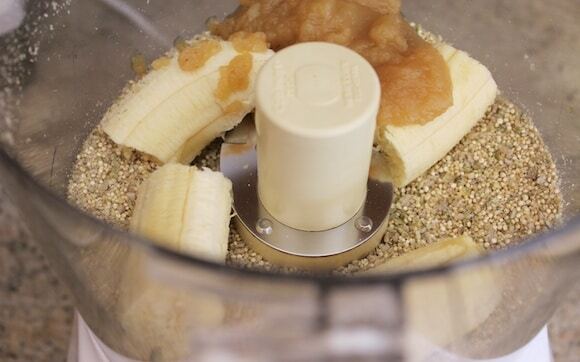 Add the banana and applesauce and pulse until combined. Pour the mixture into a medium bowl and stir in the cinnamon and raisins. Add the psyllium, chia, and flax mixture and stir gently until incorporated. 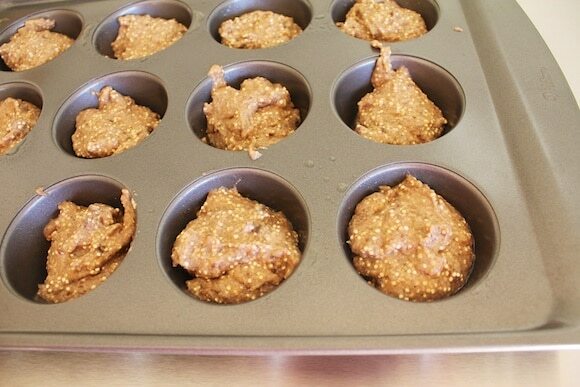 Use a tablespoon to transfer the batter into the muffin tin. Bake for 35-40 minutes or until the tops of the muffins turn a golden brown. Let cool completely before removing from the muffin tin. 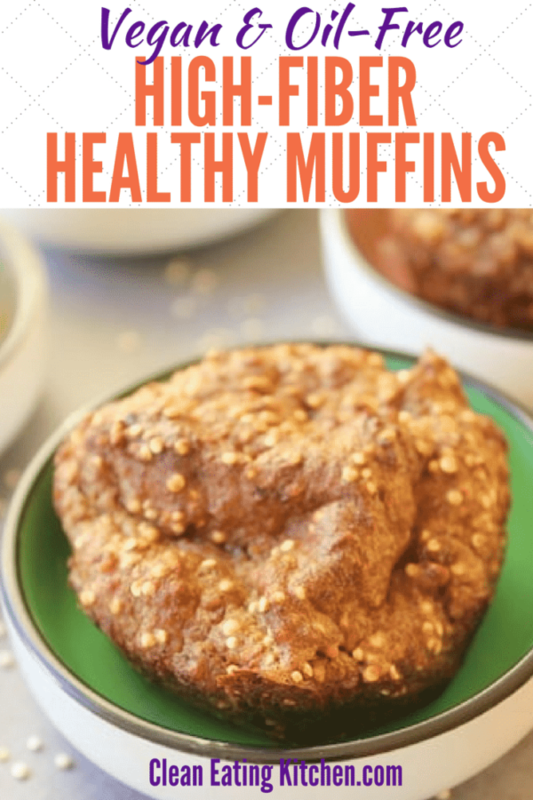 Pin this High-Fiber Muffin recipe to save it for later! 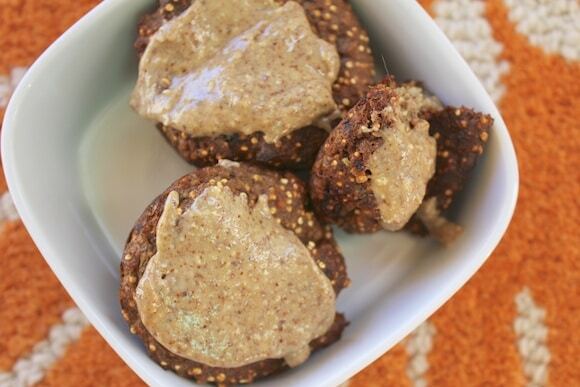 Great recipe Carrie, I have some psyllium in the cupboard somewhere so I will have to try these out. Yum! Those look great, Carrie! I haven’t yet tried experimenting with baking with quinoa–I tend to stick to the traditional steamed variety. This certainly inspires me to get baking and think outside the quinoa bag! Just checking: no baking powder or other leavening agent? Everything in them I can eat, woo-hoo! I’ll make them to go with my supper salad tonight. What an interesting ingredient – psyllium. I’ve heard a little bit about it! Your beautiful muffins sound amazing with all these fantastic goodies in it! 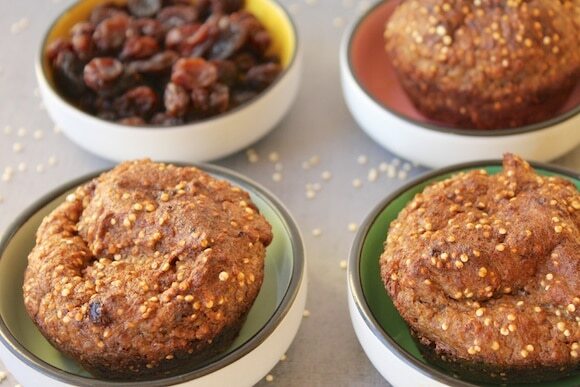 Healthy & fibre-rific muffins! And vegan & gf to boot. Sounds like a dream breakfast to me =) I will have to check out this ground psyllium stuff. I am also a psyllium fan. It works so well in gluten free baking as well. Hi Sydny, the muffins should be moist on the inside, but not terribly undercooked. The outside should be crisp. The inside will definitely be sticky, but still cooked through. Just found your blog, and immediately downloaded the app! 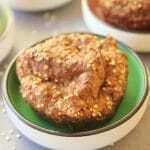 I would like to make the high fiber muffins and add pumpkin for the flavor and health benefits. Do you think I should reduce the applesauce or banana to prevent them from being mushy? Also, I read your post about PCOS and IBS. I, too, suffer from these. The PCOS symptoms started in junior high- weight gain, painful/irregular periods, and facial hair. I’ve been on the pill for more than 20 years and have added metformin recently. These have helped, but it’s not a cure. I didn’t even get a correct diagnosis until my mid-twenties. I didn’t know that there was a connection between PCOS and depression. I don’t know why not one of my doctors has ever told me that, or tried a different medicine. These conditions have taken a large toll on my life also. I’m already a vegetarian, and I’m looking to add foods to my diet that will increase insulin sensitivity and help IBS symptoms. What are the best foods to help the symptoms of these diseases? Thanks for sharing your story. Hi Kristen, thanks for the note. It’s been awhile since I made this recipe, but I think a substitution of pumpkin for the applesauce would be appropriate. I’m sorry to hear that you’ve also suffered with PCOS. I am finding it to be a huge challenge to figure out which way of eating will help the most. So far, I know sugar is a contributor to reduced insulin sensitivity, so I’m using a higher protein diet to help ease the sugar cravings and, hopefully, help address the cause. I will be writing more in the future about what other resources I find. Sending you my continued very best. AWESOME, Steven!!! Send me a few muffins? 🙂 Very cool. I’d love to know which program/website you used to calculate the nutrition data? I’m looking for one that’s easy to use. Have a great weekend! Great for breakfast. Thanks Carrie!